Ontario's PC Party would eliminate the deficit by 2017-18 — the same timeframe the Liberals pledged — and restrict welfare to people who have lived in the province for at least a year, according to their full election platform. Ontario's Progressive Conservatives would eliminate the provincial deficit by the 2017-18 fiscal year — the same timeframe the Liberals have pledged — and restrict welfare to people who have lived in the province for at least a year, according to the full election platform the party released Sunday. Other measures not previously announced include a plan to force public sector unions to "compete" with the private sector for delivering government services "where appropriate." The party suggests areas like laundry and food preparation in public institutions. The Tories would also keep to the Liberal government's scheduled rollout of full-day kindergarten, something PC Leader Tim Hudak had previously called a frill. 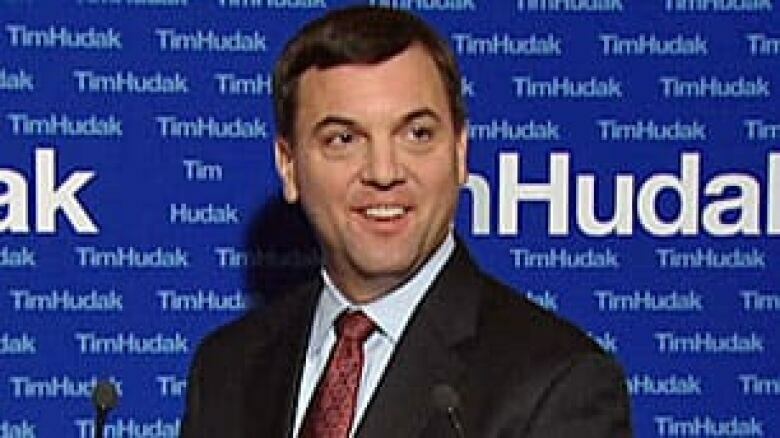 Hudak already disclosed several major platform items in a speech Saturday to party faithful gathered in Toronto. Those included modest personal tax cuts that would save $258 a year for someone making $70,000, income-splitting for households (yielding up to $1,363 in annual tax relief for single-income couples) and $8 billion in total additional spending on health and education. "This is about addressing the issues here and now, concerns that families have about will their kid have as much opportunity as they had, will services that they count on like health care and education be there when they need them?" Hudak said Sunday. "And it addresses the top issues I hear about wherever I go, whether in Toronto or Niagara or North Bay: relief on the constant nickel-and-diming from the McGuinty Liberal government." The Tories call their policy manual Changebook and are hoping Ontario voters will want a new government after eight years of Premier Dalton McGuinty's Liberals. The Liberals called the PC platform "dark and angry" and slammed its fiscal components. "He's moving numbers around like they're on a monopoly game," Infrastructure Minister Bob Chiarelli said. "The numbers don't add up. It's going to damage this province very, very significantly." The full PC platform says the party will try to tame the province's $16-billion deficit by 2018. Part of that effort will involve slashing the civil service and public-sector wages, which the document says have been bloated by "excessive contracts" awarded in arbitration. Hudak has pledged about $2.3 billion in government spending cuts. On welfare, the Tory policy manual says "it's only fair" that recipients show a "commitment to Ontario" by living in the province for at least a year before becoming eligible. The Liberals say they too would wipe out the deficit by 2018, but Hudak accused the government of keeping the public in the dark about how they would do that. "They refuse to put a plan out there publicly," he said. "My guess is because they have a significant tax increase they're going to hide from people." The full PC platform spells out details of some policy promises the Tories had already announced, by indicating that the party's proposed sales tax exemption on electricity and home heating bills would be enacted in 2012. But the Conservatives did not say exactly when they would bring in the promised income tax rate cut and income splitting. The Liberals have yet to release their campaign platform, as have the New Democrats under Leader Andrea Horwath. Ontarians go to the polls Oct. 6.